I’m really disappointed that this is the final book in the series for two reasons. One, that it’s over for now because I really enjoyed this series. Two, that it was this book. That being said, it’s not a bad book. It’s not bad at all. However, it wasn’t exactly for me. Unlike the other books, it’s largely homogeneous. It follows humans who are on spaceships. The remnants of the humans who left Earth and remained on the ships. I didn’t mind it just being about humans and how they continued surviving as a group, redefining humanity in the process. I just couldn’t get into it. The characters blended together to me. I can’t remember all of them and even as I finished the book, I couldn’t tell you too much about them. They were bland. And the plot? Also bland. There was nothing going on, nothing that interested me at least. When there was a spark of interest, it went away very quickly. That being said, it ties into the title so well. 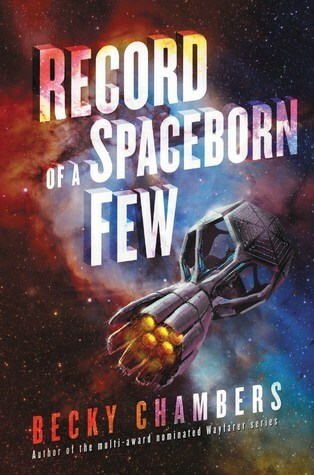 This book literally is a record of a few people who were born in space. Literally. A year in the life of these few people. I just wish that their year was more interesting. Overall, this was a very lame ending to a spectacular series. It left a bad taste in my mouth for the series. Yes, it’s good. The book is fine, but it was just such a disappointment coming off of the first two books. I went into this wanting to love it like I had loved the previous books — aka, for the plot, for the characters, for the general world — but I found myself uninterested in both. One day, I’ll reread this without expectations, but I went into this with lots of expectations and they weren’t met. Am I the only one disappointed by this read? Haven’t read it yet, but I will definitely let you know what I think when I do! I’ll look forward to your thoughts on it! It definitely was different than the first two.